When it comes to autism, there can be many misconceptions and misunderstandings in the classroom environment. Sometimes, parents of children with autism in mainstream settings are blamed for their child’s unusual behaviors; teachers may not accept that behaviors they are seeing are typical of autism. This is probably because autism isn’t always apparent when a child is able to speak and respond in appropriate ways for the majority of the school day. Some of a child’s sensitivities may be labeled by some teachers as ‘grandstanding’ or ‘fussiness’ that is enabled or reinforced by parents. The child will only eat certain types of foods. Teachers may say: the child hasn’t been trained to eat healthy food by the parents; or, the child hasn’t been introduced to the right foods at the right time, plainly the fault of a disorganized parent. The child has toileting issues. Teachers may say: the parents are not following the right routines at home, or are too lazy to bother toilet training. The child has a reduced number of activities he engages in (e.g., computer games) both at school and home and prefers to play these games rather than play with friends. Teachers may say: the child should spend time outside or with friends instead. How will the child learn social skills on the computer? The child goes to sleep late or has few hours of sleep. Teachers may say: this is probably because there is unregulated screen time at home because of poor home routines or lack of supervision. The child doesn’t want to play with other students. Teachers may say: there are poor examples of this at home, the child is allowed to get away with poor behavior. The child uses words in the wrong context and repeats the same phrases. Teachers may say: the child must be repeating what he/she has heard at home. If you feel as a parent that your child’s sensitivities to food, play preferences, the need to be alone or his/her communication style is misunderstood by school staff, then book a meeting to address the issues directly. 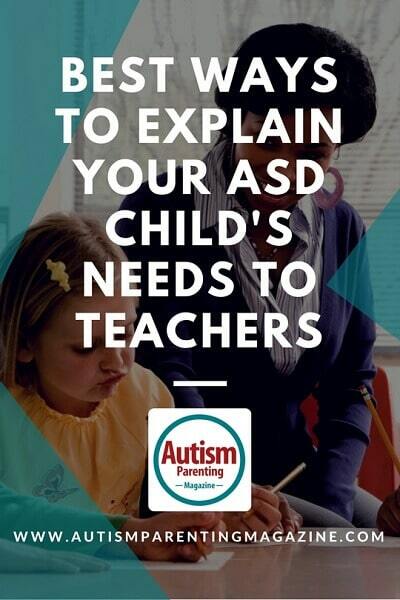 While it’s a good idea to be diplomatic, it is sometimes sensible to remind teachers that your child has specific kinds of autistic traits that affect the ability to function independently and happily through a school day. If talking about food with teachers, ask staff to understand that your child has a limited number of foods he/she will eat and to support him/her in eating food during the day, rather than questioning what is being eaten. Explain to staff that you continue to make attempts to broaden the range of foods your child can eat. If there are physical sensitivities, explain them: one of my children can’t eat strawberries, because of the seeds. If your child has a limited number of foods he/she can eat, you will need to continue to raise this issue when new staff work with your child. If toileting is a problem, keep staff updated on issues. Sometimes children with autism can refuse to visit toilets at school for sensory reasons and may have accidents as a result. They may be slower to toilet train, or have issues with night nappies for longer than other children. If your child needs changes to toilet facilities at school, or to attend the toilet during class times instead of recess, then incorporate these needs into your child’s plan. If your child has limited kinds of activities he/she enjoys being part of, you will need to continue to remind staff that your child is not limited, but rather a specialist. Reframing the way people see your child is one of the joys of raising a child with autism. Your child can certainly add in new activities, but moving on to new things is a delicate operation and sometimes as a parent it is better to pick your battles. It is the same in a school setting and you can pass this idea on to your child’s school. If staff questions you about sleep habits or routines, be clear that you are a parent who considers the welfare of your child at all times, but no matter the routine, your child has problems sleeping. Don’t be afraid to ask staff if there are things during the school day that you are concerned about. Let the staff know that if your child has social or learning difficulties at school that these follow him/her home and affect the ability to sleep at night. Processing information at night and worrying about things cause significant problems for students with autism. There may be a lot of times that your child needs time alone. It may be that at break times he/she needs alone time instead participating in play time. Explain to staff that being alone at times during the day helps your child stay at school. Tell them you are not worried about your child having friends, at this point being at school is more important than socializing during breaks. At times your child may use phrases that are well known to him/her instead of using newer words to describe things. It is typical for students with autism to use well-word phrases or scripts to avoid real communication exchanges. This may be because of the inability to think quickly to respond, or because they don’t know the right thing to say, so they say something familiar. Some parents train their children to remember familiar responses, so explain this to staff. If you have concerns about the validity of classroom routines, it does not hurt to ask about them—sometimes questioning staff about what they are doing sends the message that you also have ideas and strategies about how to best deal with your child. Finally, remember that staff who see you as an active person in your child’s life are more likely to remember that your child has a team of people around who understands his/her needs. Parents are the people most likely to understand their child’s needs and worries, so it is important to remember that your visible presence is vital. Good teachers listen and interact with parents and understand they are a key part of every child’s success. Leigh De Silva is a registered teacher who works in mainstream special education settings. She is also the mother of a young adult and teens who are on the spectrum. She has researched the social understanding of girls with Asperger’s syndrome in social groups as part of her Master of Autism Studies at Griffith University, Queensland.